This Dar Piazza polished chrome 3 light pendant feature K9 crystal squares around the edge. A modern, bright and classy pendant light, with circular ceiling mount in polished chrome, three wire suspension and circular frame containing the three lights. The outer rim of the frame is covered in faceted K9 crystal squares that will give a sparkling light and the lower frosted diffuser with give softer downward illumination. 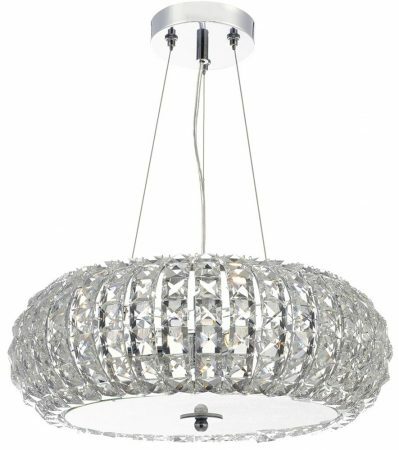 A 40cm diameter pendant dripping in crystal that would look fantastic in any room to give instant style and a luxurious feel. Ideal for installing over a dining table, in a living room, bedroom or hallway. Height adjustable at the time of installation, please see below for measurements. With a minimum height of just 28cm, this is the perfect pendant for rooms with a low ceiling. A class 2 double insulated ceiling light, no earth required. Dar lighting is widely recognised as one of the leading suppliers of a full range of innovative, quality lighting products such as the Piazza 3 light pendant with K9 crystal featured here.